Investment made to handle longer run lengths and strengthen service capability. L R David Adamson HP Scitex_Xavi García HP Scitex_Jonas Bergstrom MD TB Screen_Nachum Korman EMEA Large Format Sign & Display Industrial Sales Director and Jesper Skantze CEO SchneidlerTB Screen, which also has four other HP large-format printers, serves a host of retail, outdoor events and advertising clients throughout Scandinavia. It made the investment to strengthen its service capability and fulfil an increasing requirement for larger run lengths, particularly in relation to POS/POP print jobs. Jonas Bergstrom, managing director of TB Screen has no doubt that the attributes of the HP Scitex FB7600 set it apart from other industrial printing systems. 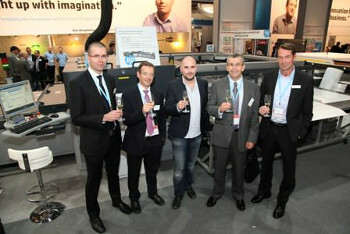 The purchase was made through HP’s Swedish channel partner, Schneidler, and included the recently announced Hostert Automatic Loader. Bergstrom said the device was a major factor in the decision to install the FB7600 because it allows high-volume print shops that produce long repeating runs to reduce production costs, improve turnaround time and create an automatic working environment with pallet-to-pallet operation. “We anticipate the new loader contributing to the FB7600’s overall capability to enhance production workflow and enable us to shorten delivery times for our retail customers,” he continued. With four other HP large-format solutions installed, Bergstrom also acknowledged Schneidler’s important role in the buying decision. “Once again, we worked closely with Schneidler, whose customer support team is first-class, so it’s reassuring that a professional back-up team is there, should we need it,” he said. TB Screen AB grew sales by 30 per cent last year and with the continued expansion of its large-format print portfolio, Bergstrom and his 28-strong team will soon relocate to a new, custom-built, 5000m2 facility. The Scitex FB7600 Industrial Press can print up to 95 full-size sheets/hr in production speed and up to 55 full-size sheets/hr with POP quality on a wide variety of media up to 25mm thick. HP pointed out that the six-colour UV-curable HP FB225 Scitex Ink set provides excellent dot gain and an impressive colour gamut up to 600dpi resolution. In addition it said a new edge-to-edge printing feature can produce final-size sheets, which eliminates the need for trimming, saves substrates and reduces product damage caused by additional handling.